More Institute & A.T. Kearney proudly presented Copenhagen Roundtable 2011, November 17th. 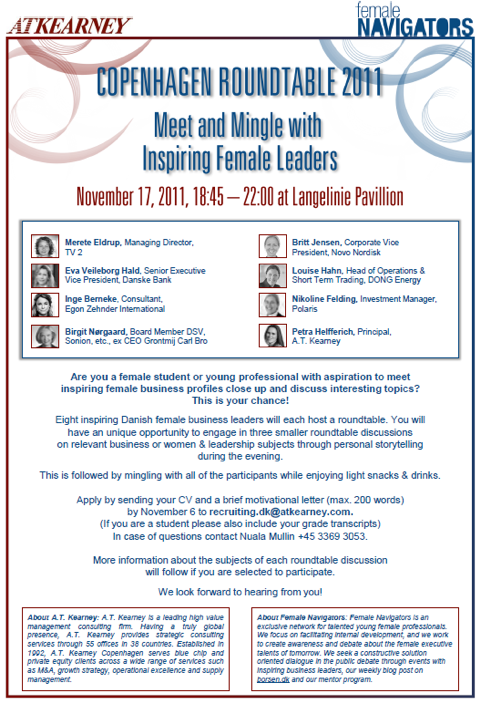 Write us an email to event@femalenavigators.com with your idea. More Institute and A.T. Kearney, “Copenhagen Roundtable”. Inge Berneke, ”Kvinde kend din Karriere”. Kim Fournais, Asger Aamund & Ulrik Sanders: ”Women and Leadership”. Eva Hald, Marianne Philip, Majken Schultz & Helle Breinholt: ”Women on Boards”. Malou Aamund: ”Career choices, challenges and ambitions”. Lars Einar Engström: ”Confessions from a sexist”.